Kale is something we never ate growing up. In fact, my mother grew large and verdant bushes of kale in her vegetable garden to feed our green iguana who lived in a gigantic cage in the basement. (One of the many exotic pets that populated my childhood.) Oh, but we didn't know what we were missing! These days I just can't get enough of it. I threw a dinner party last week. The menu was simple and all about comfort. A rustic meatloaf, loosely based on this recipe, but with a little surprise embedded deep within - hard boiled eggs, a signature of my grandmother's hearty meatloaves. Simply place a third of the meat mixture on a baking sheet and lay three hard boiled eggs lengthwise down the center. Then mound the remaining meat on top and around the eggs, and form it into a loaf. The kids enjoy getting their "surprise," and I enjoy the memories when I slice into the loaf. Garlic mashed potatoes were served alongside, smothered in a rich, meaty gravy. There was also a warm loaf of whole grain, farmhouse bread, and these mushrooms, doused in wine and lots of garlic. I needed something light to complete the meal, but with enough body to hold its own against the bold flavours of the evening. 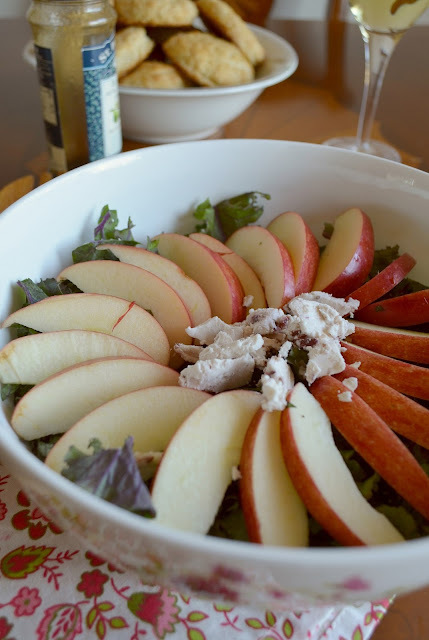 This kale and apple salad was just the thing. Raw, organic red kale that was almost too beautiful to cut; tart gems of dried cranberries; sweet honeycrisp apples; and a fabulous cranberry-cinnamon goat cheese from La Bonne Vie to top it off; all dressed in a simple, sweet raspberry-balsamic vinaigrette. 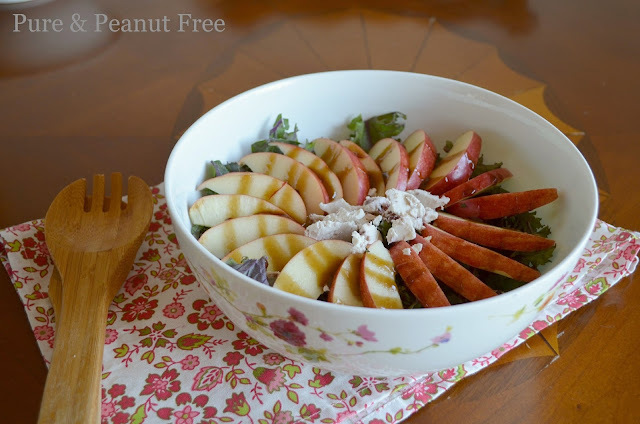 The perfect hearty salad. I could eat this every day! Upon my children's request, for dessert I made these charming little raspberry shortcakes, topped with curls of bittersweet dark chocolate. They're something we saw as we walked through a bakery several weeks ago, and my kids have been dreaming of them ever since. You know kids - once they get an idea in their heads, they just can't let it go. Of course, the ones in the bakery weren't safe for my little, peanut allergic sweetheart, but mine are. And I bet they tasted just as good. The ultimate comfort food. With wine and laughter that flowed late into the evening, followed by smooth, dark coffee and deep conversation, the dinner party was a smashing success. I'm already planning my next one. 'Tis the season for entertaining! Prepare the dressing by placing all the dressing ingredients in a glass jar with a lid. Seal and shake well until combined and emulsified. Set aside. Tear the kale from the center rib of the leaf. Wash well and spin dry. Chop the kale fairly fine. Place in the serving bowl. Add the cranberries and 1/2 the dressing. Toss well. Cut the apple in quarters and remove the core. Slice the apples thinly and arrange on top of the kale around the outer edge of the bowl. Crumble the goat cheese and place in the middle on top of the kale. Drizzle the remaining dressing over top. Preheat your oven to 425 F (220 C). Line two baking sheets with parchment. Whisk together the dry ingredients. Add the cubes of cold butter and, using a pastry blender or your fingers, quickly cut the butter into the flour until the mixture resembles coarse sand. Stir in the milk until the mixture is evenly moist. Let the dough rest for five minutes. Turn the dough out onto a floured surface and press into a 10 inch round that's about 1/2 inch thick. Using a floured 3 inch biscuit cutter (or the top of a glass), cut the dough into rounds (you should get about 10). Place the cakes on the baking sheets and brush with a little extra milk. Sprinkle the tops with coarse sugar and bake for 10 - 15 minutes, rotating the pans halfway through, until golden brown. Cool before assembling the shortcakes. In a chilled bowl, combine the cream, vanilla, and sugar. Beat, using an electric mixer, until stiff peaks begin to form. To assemble the shortcakes, cut one biscuit in half horizontally. Place a layer of raspberries (with the accumulated juice) on the bottom half. 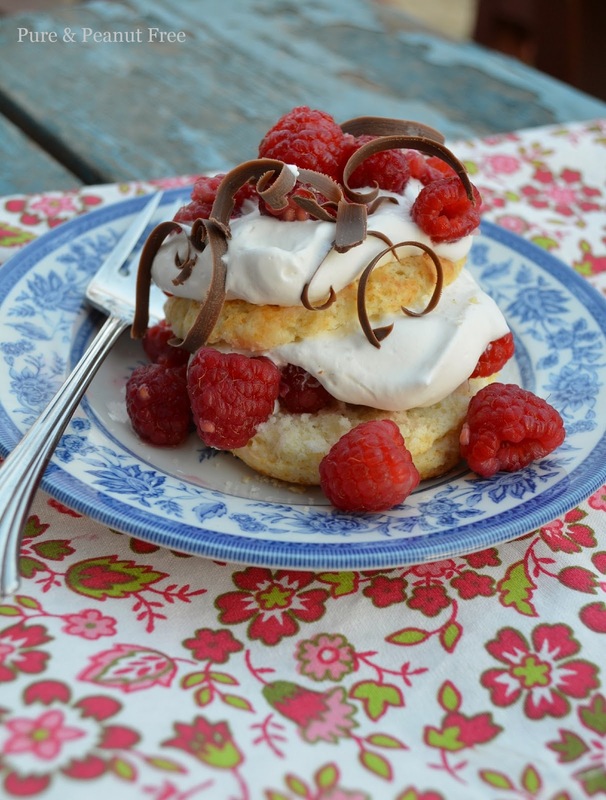 Put a layer of whipped cream on top of the raspberries. Cover with the top half of the biscuit. 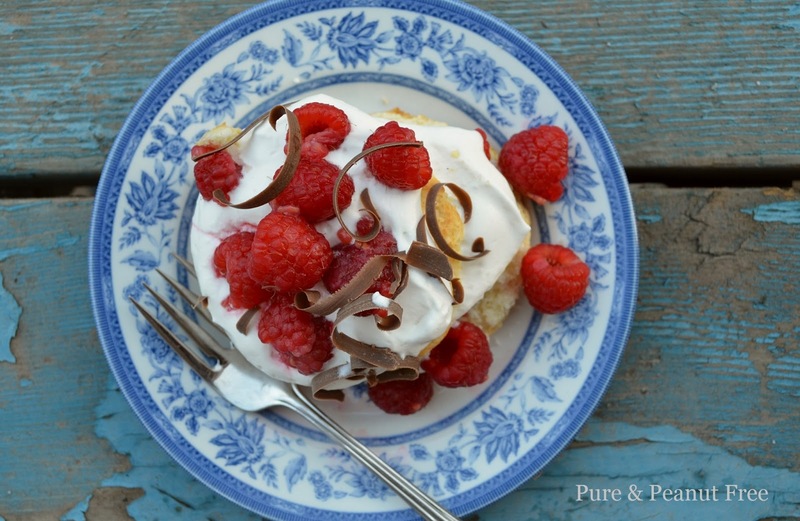 Top with another layer of whipped cream, and then a layer of raspberries. Using a vegetable peeler, gently shave curls of dark chocolate over top. Serve immediately.